US First Lady Melania Trump has been caught up in another plagiarism row, following the launch of her new online safety for children campaign on Monday. A booklet put out by Mrs Trump bore a striking resemblance to one published under the Obama administration. The text and graphics of the "Be Best" booklet were nearly identical to those in the previous edition. The White House said that Mrs Trump had sought to used her position to "amplify" the text's positive message. In 2016 Mrs Trump was accused of plagiarising parts of a speech from a 2008 address by Michelle Obama. 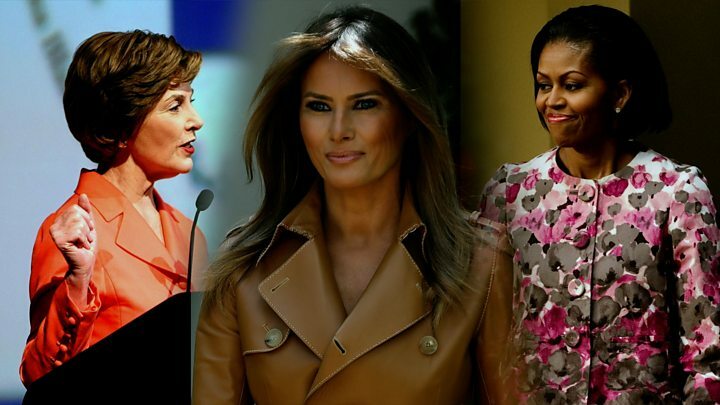 After commentators picked up on very close similarities between the two speeches, Meredith McIver, a Trump administration staff member who wrote Mrs Trump's speech, admitted borrowing from Mrs Obama. 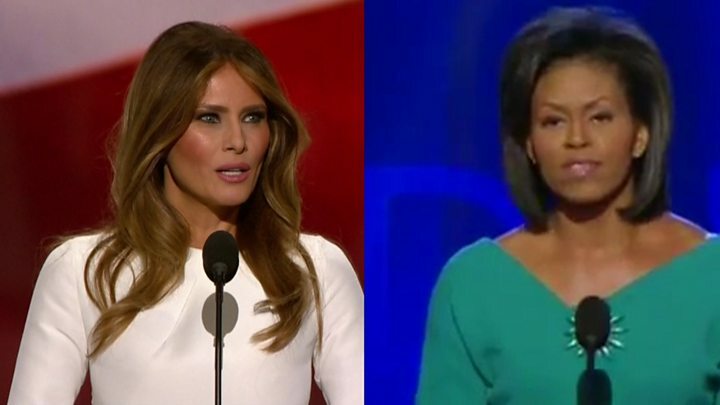 Media captionDid Melania Trump's speech copy Michelle Obama's? Mrs Trump's online safety booklet was initially billed on the initiative's website as being "by First Lady Melania Trump and the Federal Trade Commission". After similarities to the Obama-era edition were picked up online, the text was revised to describe it as a "Federal Trade Commission booklet, promoted by First Lady Melania Trump". A White House statement released on Tuesday accused "opposition" media of taking "a day meant to promote kindness and positive efforts on behalf of children, to instead lob baseless accusations towards the First Lady and her new initiatives". It said that the Be Best initiative was aimed at supporting children and opening dialogue on issues affecting them - including by helping the Federal Trade Commission to promote the booklet - and called on media workers "to attempt to Be Best in their own professions" by focussing on Mrs Trump's programme. Launching the "Be Best" initiative at the White House on Monday, Mrs Trump said the aim was to promote healthy living, encourage positive use of social media, and combat opioid abuse. "As we all know, social media can both positively and negatively affect our children, but too often it is used in negative ways," she said. Her decision to focus on cyber-bullying has prompted questions about the behaviour of her husband, who frequently uses Twitter to attack and insult his opponents. Mr Trump was widely criticised in 2017 when he used the platform to call TV hosts Mika Brzezinski and Joe Scarborough "low I.Q. Crazy Mika" and "Psycho Joe", and claimed he saw Ms Brzezinski "bleeding badly from a face-lift". He has also been accused of mocking a disabled reporter. White House Press Secretary Sarah Sanders was asked ahead of the launch of the initiative whether President Trump believed he bore any responsibility for the need to address cyber-bullying. "I think the idea that you're trying to blame cyber-bullying on the president is kind of ridiculous," she said. What is the Einstein visa? And how did Melania Trump get one?